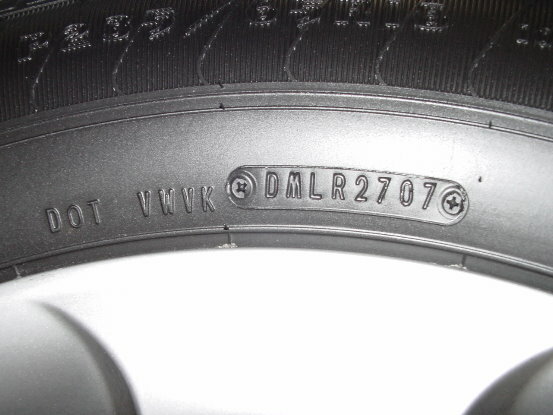 Update April 2015: NHTSA (National Highway and Traffic Safety Administration), the branch of the US government that regulates tires (and in this case, what is required to appear on the sidewall), has annouced that they have run out of 2 digit plant codes (see below) and are making a change to a 3 digit plant code. I have updated the web page to reflect those changes. I get a lot of questions about how old a tire is. You can tell that - and a lot of other things - by reading (and decoding) the DOT code. G (Gee), I (Eye), O (Oh), Q (Que), S (Ess), and Z (Zee) are NOT used because they look too much like numbers. The first 2 or 3 digits are a code for the manufacturing plant. Prior to April of 2015, all plant codes were 2 digits, but after April of 2015, a third digit was permissible, and 3 digits are required by April of 2025. This means there will be a period of time where there will be both 2 digit and 3 digit plant codes. To make the transition easier, NHTSA has reserved a series of 3 digits codes starting with the number "1" (One) followed by the previous 2 digit codes. It is NOT required that everone use this coding system, but I expect everyone to do so. So from April, 2015 to April, 2025, you will see both 2 digit and 3 digit plant codes - and the existing plant codes COULD use a "1" (One) in front. Nothing else in the coding system has changed. If you look to the right, the plant code for the DOT number would be 5M. From time to time, this gets updated, but don't depend on this being 100% right. So if you look "5M" on the web site linked above you should get Bridgestone in Sao Paulo, Brazil. Please Note: I don't know if or when the Harriger web page will be updated. So just be aware that there could be some discrepancies. The next 2 digits are a code for the tire size. The exact translation of the code is not prescribed by NHTSA. It can be anything the tire manufacturer wants it to be - but there has to be a system that can be explained. Please note: This manual also gets updated from time to time, so don't assume this version is 100% accurate either. Also do not assume that everyone uses this coding system. I am aware that many European based tire manufacturers use a different system. So looking at the DOT code to the left - the plant code is "VW" = Sumitomo in Osaka, Japan - and the size code is "VK" = 255/50R16 (or maybe something else!). 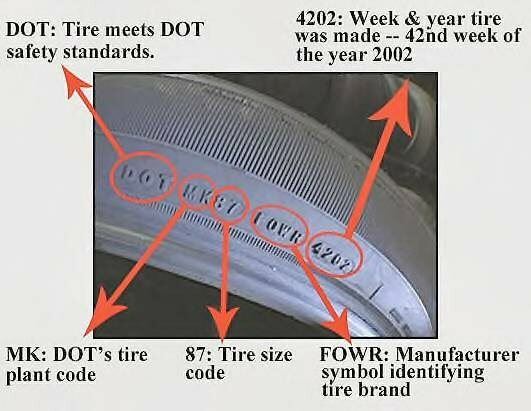 The next 3 or 4 digits are a code for the type of tire. The exact coding is up to the tire manufacturer - and is different between tire manufacturers. 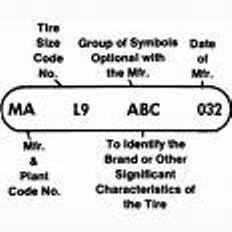 The coding is optional, but since many tire manufacturers use the code to track returns, I don't know of anyone who doesn't use this coding. The photo to the right indicates that the "X" is for Michelin. While it may be true that all Michelin tires have an "X" in the type code, it is NOT true that Michelin is the only one who uses an "X" in the type code. Editorial Comment: One of the reasons I did this web site is because of things just like the photo to the right - Misinformation! 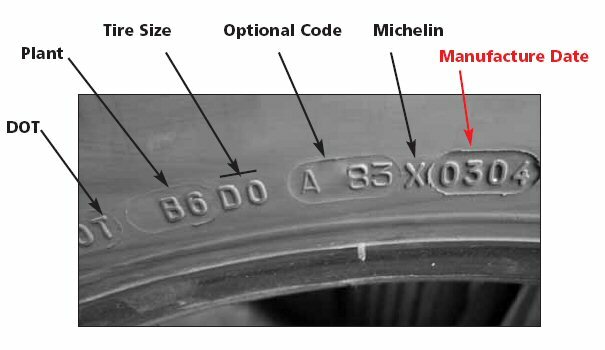 So the plant code to the right is "B6" = Michelin in Spartanburg, SC, USA - and the size code is "D0" = 175/65R13 - and the exact tire is identified by "A83X"
The last 3 or 4 digits are the date code. The format is week/week/year/year or week/week/year. These are always numbers. Starting in the year 2000, the date coding used was 4 digits. Before 1999 the format was 3 digits. 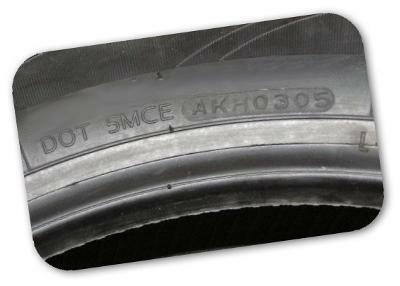 1999 and 2000 are transition years, so you will find both 3 and 4 digits used in tires produced in that time frame. 032 = the 3rd week of 1992 (or 1982 or 1972!) but not 2002! Please Note: The date code only has to be on one side – and it is permissible for there to be a partial DOT code, so long as one side has the complete code. It is fairly common for everything except the date code to be on both sides, with the date code only being on one side. However, this created a problem for some manufacturers as this is typically the top half of the mold and to change the plate every week would require a man to stand in the hot bottom half of the mold while he made the change. Not only was this dangerous (Did I mention that it was hot? ), but it also created problems with dirt and foreign objects in the bottom half of the mold. So they have petitioned NHTSA to change this requirement. I do not know what the outcome of this is going to be.